Congratulations on being admitted to University of Puget Sound! You and your family are invited to participate in a special event to experience Puget Sound firsthand. 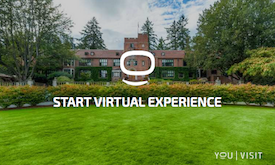 Take a tour, discover academic opportunities, and meet Puget Sound students and faculty. If you have questions, please call us at 253.879.3211 or email us at admission@pugetsound.edu. We look forward to your visit!